Handmade in Kansas City: Why is it beginning to look a lot like Christmas? The other week I walked into one of my favorite stores, Alter'd State, hoping to fish through their sale corner for some sweet summer deals. But I could barely stand to be in there for more than 10 minutes (not nearly long enough to hunt for sale steals). The whole store was decorated for Christmas (and at the time we still had a few weeks till Halloween) I'm talkin' full on Christmas mode, trees were up, fake snow and tinsel were all over and Christmas songs were playing. Now don't get me wrong, this grown kid loves her some Christmas. And I have been known to listen to Christmas music at random points in the year. When fall rolls around I make sure to hold off on Christmas things till after Thanksgiving. I love Halloween and Thanksgiving and by holding off on Christmas, the holidays that come before it are given room to be celebrated. So for me Alter'd States decor/music was too much, I mean it had just officially become fall! It's not only this store that has jumped the gun, so to speak, on the holiday decor. Our favorite craft stores have pushed aside the fall holidays in order to promote their winter crafts, decor and everything else Christmas. Lex was in Michaels the other day and they had one small section for thanksgiving, and half the store was Christmas and winter-themed products. The two of us complained to the other and vented about our frustration with the commercialization and domineering effect Christmas has on stores and the craft market, but then we tried to turn it positive. We both began thinking about how we can counteract this avalanche of Christmas. we started by agreeing that we would not roll out any Christmas themed products until we got closer to Thanksgiving if not until the day after. That if we did any vlogs or blog posts we would make them about Thanksgiving or fall activities. While doing this we began to see the commercialized side of Christmas as an opportunity for hand made makers to push into the fall themed things. Clearly, the big name stores don't emphasize it enough, not think it's worth their time, so maybe this is a place were hand made makers can shine. We can be the one who can fill the need for fall decor and goods because I know I'm not the only one who wants the Christmas train to stay put for another month. 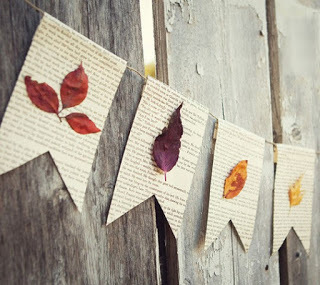 If you are looking for ideas of things you can make then check out this post on fall crafts, from Handmade in KC October blogs, and learn how to make some great fall decor like this Book Leaf Garland. I mean how great is that? I know I m adding this to the list of things I am making for thanksgiving. While you are there be sure to check out the other blog posts and the Creators on the seller's page to see what they have for sale AND like the HIKC facebook page and bookmark the Handmade in KC site for easy access to updates!! Be sure to comment with what you are going to be making for Thanksgiving and when you start decorating for Christmas! Happy Fall Y'All, From the A-Team @x37adventures!